Chert Glades Stream Team # 5692. Everything done to the land affects the quality of the water in your watershed. Streams and rivers provide vital habitat and a source of fresh water for fish, wildlife and humans. Humans can harm water condition but we can also play a part in restoring habitat and water quality. One way we can protect a stream is by monitoring its health. Our Chapter’s stream team recently adopted Ben’s Branch stream located within the Cardinal Valley Natural Habitat Restoration Project (from now on referred to as Cardinal Valley), in Webb City, Missouri. Ben’s Branch stream is a second order intermittent stream. It joins Center Creek, a fifth order stream within the Spring River Watershed Basin. This watershed area is within the Oronogo-Duenweg Mining Belt, abandoned and left contaminated by tons of mining waste, left in uncovered piles. Runoff from these piles has entered groundwater and surface streams, contaminating them with lead, zinc and cadmium. Over the last few years, the Environmental Protection Agency, Missouri Department of Natural Resources and Webb City, teamed up to clean, reclaim, and return the land to a more natural habitat. Northwestern sections of the restoration area include a wetland area near Center Creek that will help remove zinc and other heavy metals from the effluent water leaving the Center Creek Wastewater Treatment Plant and then running into Center Creek. 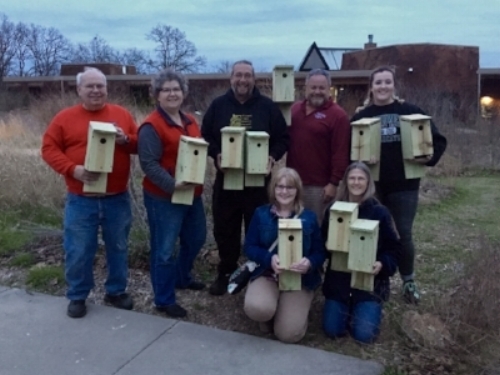 Our chapter volunteers built and installed 6 bluebird houses to provide safe secure locations to raise bluebird broods. The open wetlands lack natural nesting cavities needed for successful nesting, making proper birdhouses even more critical. Nesting results are studied and recorded with Nestwatch.org. Recently 200 swamp milkweed bareroot plants were installed at the wetlands, in efforts to provide increased population of Monarch host plants and nectar for Monarchs and many other pollinators. March 2019 our volunteers planted a variety of 200 total soil erosion and pollinator friendly shrubs along Ben’s Branch Stream. In addition, we threw out 25 swamp milkweed seed bombs. We thank the Missouri Department of Conservation State Nursery for the hundreds of free milkweed and other trees and shrubs given to us for our habitat reconstruction projects! Studying best practices at other locations, before we built the Bluebird houses. Two were built, now looking for the best locale to hang them. Done! Now let’s hang them up. 1 of many installed. This year was location testing. A handful of Monarch’s stopped by Cardinal Valley Wetlands. They were looking for nectar for energy and a place to lay their eggs. So we planted milkweed. The swamp milkweed is now in the ground. Visit next summer to hopefully view its beauty. Bank stabilization plantings are crucial to improving water qualities by absorbing excess nutrients such as nitrogen and phosphorus as well as protecting the stream banks from erosion by providing a protective barrier against the water. March 2019 - 200 pollinator friendly and bank stabilization shrubs put in the ground along a 750 feet of riparian corridor of Ben’s Branch stream. Thanks team, the critters should be returning in the coming months and years!